I am so excited (aren’t I always?) to introduce a new feature that we have here at Engaged and Ready. In association with our sister-site, The European Celebrants’ Collective, I’m going to start showcasing celebrants from all over Europe and beyond, right here on these very pages. Because the European Celebrants’ Collective is a membership site for Celebrants who want to be the best that they can be at what they do, who take their development as a Celebrant seriously and who actively work to better themselves as Celebrants on a personal and professional level. And so you can see why we might want to show off our Celebrant members. Of course! 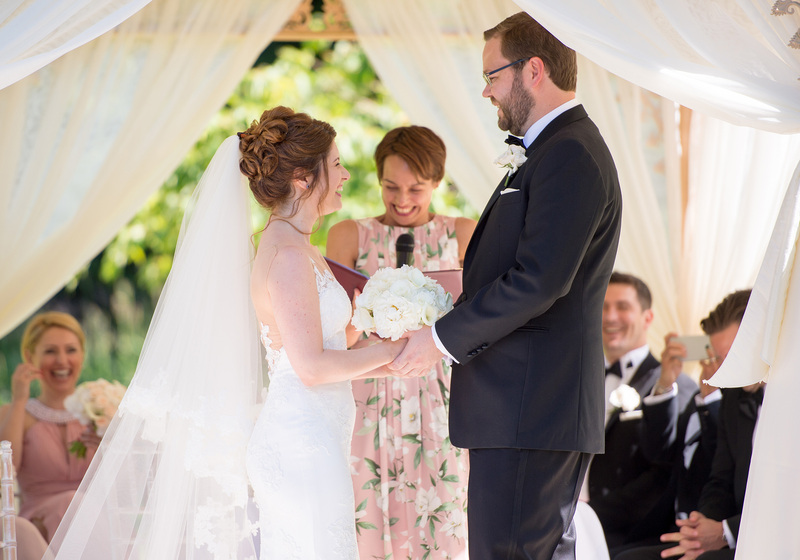 Being able to hear from Celebrants themselves, talking about what they do and how they do it, can really help you to understand what you’d like (or not) for your own ceremony. Hearing directly from people involved in wedding ceremonies on a regular basis is a fab way to get a lot of insight and inspiration, which you might not otherwise get. So do get stuck in and sup up all of these wonderful ideas, wisdom and experiences being shared here today. I’m over-the-moon to kick start the first spotlight Celebrant interview with European Celebrant Rosalie Kuyvenhoven. As you may be able to tell from Rosalie’s surname, she is Dutch, but is a British-based Londoner having lived there for almost five years. She conducts ceremonies around the UK and internationally too. And here’s a little fact about Rosalie, she has conducted a ceremony on a carousel, yes you read that right, a carousel! Let’s find out more about her and how she came to conduct a ceremony on a carousel! Since I was a child, I have been fascinated by how people deal with the questions and experiences that life throws to us and the creative expressions they use to give meaning to love, life and loss. I studied theology to learn more about rituals and beliefs and was trained as a minister. However, the church felt too restricted for what I was looking for as my fascination included religion but was not limited to it. When we got married, my husband and I looked for a creative and unique way to celebrate our love and commitment, combining our religious and non-religious beliefs. We were very lucky to work with a minister who respected this wish resulting in the ceremony that felt right for us: we had a mix of religious and secular readings, my vow was in the form of playing a piece on the piano, and we designed a food-sharing ritual in which we included family members and friends to share wishes and blessings. Another defining experience was when my father unexpectedly died. He had written a script for his funeral. It took place in a theatre, and was completely led by our family, including carrying the coffin, music played by ourselves, and flowers from my father’s garden. When I discovered the celebrant profession it immediately felt like coming home. It is a vocation in which I can apply my passion for and knowledge on rituals, and create bespoke ceremonies that are meaningful and relevant for the people involved. I will never forget my very first wedding ceremony! It was a precious experience and for many reasons. The wedding took place in France, and the couple said their vows in a carousel, surrounded by their guests who were sitting on beach chairs. It was a beautiful, fun and relaxed setting. The groom had a Jewish background and the bride has had a Catholic upbringing. Although both were no longer practicing these faiths, it was important to them to incorporate some of these traditions in their ceremony. We took a traditional element from a Jewish wedding ceremony, The Seven Blessings, and applied it in a modern and personalised way. We used contemporary phrases and asked seven family members to read a blessing and add a personal wish or reading to their blessing. It was amazing to see this work and it confirmed why being a celebrant was the right thing for me to do: creating something new and relevant using traditional elements and the story of the couple involved. Besides, it was a huge honour to lead the ceremony and to make a difference on their special day. Think what is really important for you on your wedding day and don’t do things because you think you should do them. This is YOUR day. Stay true to yourself. No, you don’t have to wear a white dress. Yes, you can walk down the aisle together. And no, a wedding does not have to be overly expensive or extravaganza to be beautiful and meaningful. Decide what is important for you, and think what role the ceremony plays on the day. Not all couples realise what a profound experience a truthful wedding ceremony can be. This is your opportunity to share why you have chosen to be with this person, and what they mean to you. This is your opportunity to frame your vows in a way that truly reflects your story, and why you have chosen to build a future together. Thinking about these questions, and saying your answers out loud, or using a rituals to symbolise this, is not something most people do on a daily basis. It can add a deeper layer to your relationship together, and will evoke all kinds of precious emotions, with you and your guests. A wedding day can put a lot of pressure on couples and on the day, it can be difficult to relax as you would like things to be perfect, and want everyone to have a great time. Acknowledge that it is completely normal to be anxious about the day, but try not to be too overwhelmed by it. Talk about it beforehand so you can plan for things that you worry about. Surround yourself with people who will make sure things will run smoothly on the day. Smile when something goes wrong (because it will! ), and enjoy the day, whatever happens. That love means something different to each and every one of us, and that very relationship is unique. That love is as complex and unpredictable as life self and that it takes giving, confidence, humour, hard work and a little pixie dust to make it work. It’s always new! With every couple I meet, a new story starts to unfold, and a unique ceremony is being shaped. When couples get back to me saying it was the best ceremony they could have wished for! It’s a truly humbling experience when couples take the effort and time to write a testimonial and express their gratitudes. Non-traditional, creative and meaningful ceremonies with a quirky twist. So far, the food sharing ritual has been my favourite symbolic ritual. After we had done it at our wedding I tailored it for a couple of which the bride was a food nutritionist. I’ve used it at other ceremonies as well. The idea is to have two types of food: one symbolising the sweet aspects of love (for example, a strawberry) and being in a relationship, and the other the bitter/sour side of it (for example, bitter chocolate). The couple takes a piece of each, shares this with the other expressing what love means to them. Then, all guests are invited to share a piece of fruit or chocolate with someone else, saying what love means to them. It’s a wonderful way to involve all guests and gives a nice buzz in the room. In particular, the kids love it as they always get hungry towards the end of the ceremony! What kind of ceremony theme/elements would you love to do but haven’t done yet? Muti-faith ceremony with modern Islamic or far-East rituals; ceremonies at any outdoor location with a splendid view! There is an increased market demand in personalisation of wedding ceremonies and rituals. This helps couples with mixed beliefs, multi faiths, LGTB couples and everyone else who would like to have their story and values at the heart of their ceremony, say their ‘I do’s’ in a meaningful way. Sadly, UK law still does not recognise celebrant-led ceremonies as legally binding. Couples with sparking eyes, rosy cheeks (especially when talking about the other) warm smiles who are looking for a non-conventional wedding ceremony. Tell us about a funny/hair-raising/near-miss wedding experience that you’ve had as a Celebrant. When the rings were lost 30 minutes before the ceremony! I was told by the groom that his best man would have the rings, but when I asked him, this nice chap did not have a clue! The groom’s phone was off so we couldn’t contact him. Luckily, after some searching we found the groom – and the rings just in time for the start of the ceremony. Walking in the woods, teasing my children, browsing hats and dresses in vintage shops. If you’re a Celebrant and you’d like to find out more about the Celebrants Collective, come and take a look here.